Who are the outlaw mothers? Back in the 1950s, US feminist Adrienne Rich went on a summer holiday. She spent prolonged periods alone with her sons. Writing about the experience in Of Woman Born, she explained the relief it was to escape the usual routines expected of mothers. This phrase, “outlaws from the institution of motherhood”, encapsulates the pivotal penny-dropping moment in her realisation of the power of her mothering. Upon return to normal life, Adrienne said she slipped back into the ‘good mother’ role. In a nutshell, Adrienne was describing a common problem which persists till today – the ambiguity of being a mother. For most of us, becoming a mother is the single most fulfilling experience of our lives which we cherish but it is not without pain. Being a mother involves self-sacrifice, endless patience, a large dose of self-denial and being on-call no matter how unwell or mentally exhausted we are. Is this the only way to practise being a mother or is it a social patriarchal construct? The key to the answer lies in the distinction Adrienne makes when setting out two explanations for motherhood: one “the potential relationship of any woman to her powers of reproduction and to children” and and two “the institution” which seeks to keep that potential and mothers under male control and deprives them of their potential to mother. Motherhood, therefore, is a patriarchal institution which outlaw mothers are breaking away from, to carry out empowered mothering. The former is oppressive and the latter is a women-centric subjective style. Of Woman Born is a classic feminist text that lays bare the pervasive nature of patriarchal motherhood, and how it debilitates women and undervalues the work of mothers. Adrienne was ahead of her time in 1976, when she argued that being a mother is but one dimension of a woman’s life and it should not act as a barrier to a woman participating in society. Interestingly, the book constantly tugs at the short leash of patriarchal motherhood but does not go on to define what constitutes empowered outlaw mothering. Instead, subsequent feminists have filled the void by constructing a narrative of empowered mothering as a contradiction to what the institution of motherhood is. From reading the book and listening to other feminists speak, I believe that an outlaw mother is an empowered mother who believes that her personal self-fulfilment is a key enabler of her child’s happiness and who mothers in contradiction to the prescriptive dictates of the patriarchal society we live in. My personal journey to becoming an outlaw mother began before I even became a mother 12 years ago, I now realise. I bought into the rules of the patriarchal society: that ‘good’ mothers devote their days and nights wholeheartedly to the upkeep of their children and home while the ‘bad’ ones put their careers ahead of their children simply because they go to work. The devil of the institution of patriarchal motherhood lies in the simplicity of the rules. When I was pregnant I was constantly told by people that once my child was born I would have no interest in work anymore. I began to question my own previous belief system because I loved my job and could not imagine wanting to resign from it. When my daughter was born I was happy to stay home and bond with her. We had many magical months but it was quite clear that for me to be an effective mother I needed interaction with the outside world, to be challenged and stretched, so I could bring different dimensions to my mothering. As the months went on, far more surprisingly, I realised that my daughter needed to be stimulated in ways that I could not do alone. Meeting other mothers for chats was not the way. Quite often the mothers would be having conversations while the babies would fall asleep with boredom because a busy cafe is not a place in which to develop a baby’s needs. The mothers’ network of meeting in chain coffee stores is overrated. When I went back to work I missed my little baby dreadfully but it was a joy to watch her play with other babies, have huge spaces to crawl around in at nursery and learn through interaction with other children. The benefit to her of having a mother who was using her education and agency to improve family life was invisible to society. People felt quite free to criticise me for going back to work, even going so far as to say that I ought not to have had a child. Over the ensuing years I wondered if there were other mothers who had had the same experiences. Mothers in the UK, generally, tend not to have conversations which stray beyond the confines of domesticity. One night, last year, I went online in frustration and looked up resources on feminist mothering. I discovered the Motherhood Initiative for Research and Community Involvement in Canada which was set up by Dr Andrea O’Reilly to explore feminist scholarly study and activism in mothering and motherhood issues. Joining MIRCI helped me put a language to my feelings and to feel validated. It is full of intelligent mothers who are activists and academics in mother studies. They are progressive mother feminists who are willing to break with tradition while still maintaining a fierce loyalty to their children. I have since spoken at two MIRCI conferences attended by women from across the world who do not have a fear of being accused of selfishness or an anti-father philosophy, unlike British mothers. Notable at these conferences is the scarcity of UK representation. Feminist mothering in the UK is struggling to take off for to a number of reasons, in my opinion. Firstly, the feminist movement itself does not fully recognise the diversity that exists within women’s identities and tends to campaign on single issues. It is largely reactionary as opposed to being an internalised empowering activism and views mothers as being ancillary to the cause in the sense that they are included as women, not as mothers. Secondly, policy-makers favour the family model and stereotype the single mother as one who relies on state benefits. By contrast, the mother within the family model who does not work and stays home to look after the children is unsullied by societal stigma because her male partner is financially supporting her. 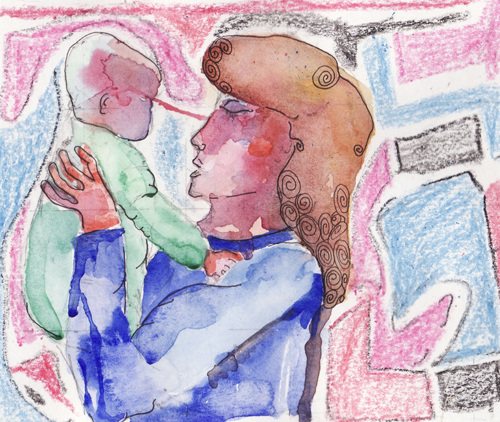 The idea of patriarchal motherhood acts to suppress empowered mothering. Finally, unfortunately the outward facing persona of mothering in the UK is the mummy blogsphere, which is as far away from feminist mothering as dry land is to fish. These bloggers often reinforce the stereotypes by writing about their baking and cookery experiences and their days out. The mummy blogsphere has not contributed to a capacity building exercise of modern mothers and acts under the mistaken assumption that the very act of blogging makes one an empowered mother. Such is the dizzy seduction of the mastery of modern technology. Mumsnet is different in that it hosts a feminist forum. Interestingly, the mummy blogsphere runs blogging competitions and one recent winner had written about the isolation of being a mother. Feminist mothering was not mentioned in her blog post but her solitary words were echoes of what Adrienne Rich wrote. The state of play of mothers in the UK is rather black and white. Good mothers stay at home and do everything for the children and her partner – playing, reading, physical care, and looking after the house. A working mother is expected to feel guilty and to put her work last. She will be watched to determine whether she is having and doing it all. This paradigm is alienating and divisive and carries risks for those children of mothers who cannot sustain an isolated way of life. Also, mothers such as lesbians, widows, disabled women and single women need to feel included in mothering. This is why I launched the UK outlaw mother movement. MIRCI started the outlaw mother discussions in Toronto as a community outreach initiative to open up discussion and debate among a wider audience and it has been a big success. I am hoping to replicate this in the UK. When I gave my first talk in at Occupy St. Paul’s in London, it was heartening to watch the women’s faces change when I described the difference between patriarchal motherhood and empowered mothering. These women had not realised either that there were other mothers who felt the same way. We even got into a discussion about the guilt mothers feel when they ask their partners for help with childcare. I anticipate that the group I set up, UK Outlaw Mothers, will initially appeal to women with left-leaning politics (as it is happening at present) who tend to be more non-traditionalists. However, I hope that mothers of other political persuasion will realise that mothering is a personal identity and act free of political colours and is an extremely gratifying experience. I may be a convert to outlaw mothering, but will it be easy to convince others? Being an outlaw mother has enabled me the satisfaction of seeing my daughter discover her potential already at the age of 12. She is the youngest child political blogger in the UK, and was voted the seventh most influential child blogger in the world. Apart from my daughter’s intellectual prowess, I am humbled by the interest that she shows in my work and other activities; and the way she has embraced the knowledge and skills that I bring into her life and how she has built her capabilities on these is more than I could ever have imagined would happen. In return, I am grateful to her for showing me how to make even more of myself as a mother and a woman. Ambition has been central to my empowered mothering hence my blogger name, ‘ambitiousmamas’. It is my position of mothering as a location for social change. My ambitions give me agency which translates into my daughter’s sense of self-worth and autonomy. I may be a convert but will it be easy to convince others? In the book, 21st Century Motherhood, written by Dr O’Reilly, she asks the question why, after 40 years of feminism, it is still the case that modern motherhood is practised as a patriarchal institution. Mothers still talk about the exhaustion, guilt, anxiety and loneliness they suffer but do not have an explanation as to why this is so. Dr O’Reilly states that this is because the symptoms of patriarchal motherhood are seen as gender essentialism for modern motherhood. If this gender essentialism is eradicated then 21st century motherhood will be viewed as being a practice of maternal empowerment. In other words, it starts with you: only you can make the change and to reclaim your power as a mother. “We do not think of the power stolen from us and the power withheld from us in the name of the institution of motherhood,” as Adrienne Rich said. the mother has full responsibility but no power from which to mother. Picture of a mother and child an original piece of art by Bethany Lamont. Image of a mother and child sculpture uploaded by Flickr user williamcho. Image of an adult hedgehog and a newborn hedgehog obtained via Wikimedia Commons. Thank you for this article. I only wish my mum could have read Adrienne Rich 30 years ago. She had post natal depression and was made to feel guilty about her decision to return to work when I was younger, despite the positive impact it had on her mental health. Even today people are still judgemental about how to be a “good mother”. During a time when I was having problems with depression I was told by a counsellor that some of my problems stemmed back to my mum working when I was a child. Looking back I wish I had been more able to challenge such unhelpful comments and suggestions. Thank you for posting a comment and I am sorry that your mother was made to feel guilty about wanting to work. Unfortunately, a lot of women still suffer from this prejudice. The comment that the counsellor made about your mother going back to work when you were a child is evidence of how entrenced the prejudice against empowered mothering is. Your story, sadly, is often told by other women whom I speak to. Why do women, even today, still think looking after children is NOT the responsibility of fathers? I’m not naive enough to believe that there are no fathers who have no interest in their children, but, as Chris Rock said, when a man said he took care of his children, “That’s what you’re SUPPOSED to do!” I am in no way letting lazy men off the hook, but as long as there are women who think that fathers looking after their own children is ‘helping’, then there are going to be some fathers who do not pull their weight. Thank you for this intelligent article which reflects both my own experiences of motherhood and many of the guilts, patriarchal prejudices and criticisms with which I’ve been saddled since having my daughter when I was 39. I was at the time senior in my field of education, so it made sense for me to return to work when she was a few moths old and for my husband to care for her until she was a year old, which brought much criticism on our heads, but if I’d been single, a lesbian or a widow I wouldn’t have had the choice; I’d have to earn! Recently I have retired early after a long career as a headteacher, at the age of 55. the circumstances leading up to my retirement weren’t ideal and involved much ill health, but my daughter seemed to feel a real loss of identity on my being forced to end my paid career earlier than intended; she strongly identified with my being very senior and a woman because she remembered nothing else; I became a headteacher when she was a baby. She takes it for granted that women can have careers, get to the top and have children, and my encounter with some real patriarchal discrimination shocked her more than it shocked me! I love the fact that she takes her feminism for granted; I wish i could! But if I had £5 for all the times I’ve been called a “bad mother” I’d be a very rich woman. It’s no good telling these people how much i love my daughter; they just don’t see it! Fortunately, despite being a teenager, she does, at least most of the time! Thank you for your comment which raises a host of legitimate questions and thoughts about the role of fathers. When I used the word ‘…help’ I was referring to a common situation that is experienced by mothers who feel/are made to feel that looking after a child is their job, primarily. I was writing from that point of view. My personal view is that fathers ought to be involved in parenting. However, there was only so much I could say in this article of which the primary focus was feminist mothering as an individual practice. Where I say ‘or an anti-father philosophy’ I am making reference to the fact that feminist mothering is an inclusive act. I’m so stoked to read this, and I agree with so many of the points you’ve made. The only bit that worries me somewhat is the last one, “only you can make the change and to reclaim your power as a mother…etc”. While I agree that how mothers construct/understand their own roles is enormously important to our empowerment, it’s not simply a question of rising up and throwing off our psychic shackles. There are structural systems at work that keep (or try to keep) us locked into place as the linchpins of capitalist economies. Yep, mothers are fabulous workers – whether or not we engage in paid labour. As a working mother of two small children and caregiver to my physically-challenged partner, I can attest that my most empowered moments have unfolded, or been enabled, when I’ve been plugged into empowered or empowering communities who grapple with the brass tacks of labour-sharing. The problem for many of us is that once you’re locked into the grind, so to speak, it’s not always easy or possible to reach out and forge (or even find) those connections. Thank you for giving alternative mothering values a voice – I certainly feel while not ostracised, I have to hide my values and my work and my stresses from the other mums in the playground and I have a sense that my work colleagues are similarly quiet in turn in their own playgrounds. I read Of Woman Born over 30 years ago. I came to motherhood as a, albeit lapsed, feminist and it took quite a bit of courage to open it up. But I discovered a writer and a book that expressed exactly what I experienced in my attempts to be a mother and also be a person. There was little support at that time for the effort. But, one mother at a time, I discovered a community of mothers who tackled the ambiguity of motherhood in a variety of ways. Those women are still my friends – the stay at homes, the employed – we came to trust our own instincts in mothering and self knowledge. Another book, which I think is out of print, had a great effect: Maternal Thinking, which used the paradigm of mothering to establish a politics of peace. Thanks for this wonderful blog. I see my daughters, their friends, and colleagues struggling with the same issues that we did back in the day. Someday we’ll change the world. I can only agree that UK feminist mothering seems to be virtually non-existent, at least on the web. Whilst I have other ‘feminist mothering’ sites on my Reader, none of them are UK-based. If anybody knows of any others, please share! The law in relation to children having contact with parents is governed by a ‘paramount consideration’ that everything a Court orders should be done for the welfare of the child in mind. In general, there is a presumption that contact with both parents is in the best interest of a child – but this is obviously not always the case. The reason why parents (it applies to mothers as well) do not have a ‘legal’ right to have contact with their children is because this would clearly introduce conflicting legal argument against the ‘paramount consideration’ -the child’s welfare. As for the father paying money for the upkeep of his children, I’d have thought this perfectly just. He’s fathered his children, so it is only right that he contribute to their financial needs – if he is able to do so. I’m fascinated by the comment from ‘Jane’ – “family justice in Britain deciding that men don’t have an automatic right to maintain contact with their kids (but have to pay for their upkeep).. is some backwards perverted result of the patriarchal status quo and women’s acceptance and presumed welcoming of a dependent role…” because where I struggle with this article is that it seems to me based on a rather retrogressive POV: Modern fathers have changed dramatically in their approach to taking care of children, and I don’t think it’s too much of a generalisation to say that today almost all would want to play an equal role in caring for their children. Yet the main parties who successfully campaigned against a presumption of shared parenting in the recent Norgrove Review were women’s groups. In the US the National Organisation of Women has also campaigned against shared parenting. In that case, is it fair to say that the traditional view of a mother’s role – that she be solely responsible for the care of her children – is ‘patriarchal’? That seems to imply that it’s men who enforce that role, when all the evidence seems to be – and as Jane points out – that it’s women and mothers themselves who vociferously demand and defend this position. Thank you for your personal account which moved me to tears. Retiring at the young age of 55 cannot have been easy for you and I am sorry that it was due to ill health. The Brookings Institute in America reported in an article titled: ‘Children’s Economic Well-Being:2011’ that children do suffer from a parent’s job loss. In so many ways she is blessed to have you as a mother who has taught her that women can, as you say, have careers and get to the top. I attended a talk by Madeleine Albright recently and she said that her grand-daughter cannot believe why there was such a fuss over her (Madeleine) being the first female Sectretary of State. You are in good company. I invite you to join my group. A number of women have emailed me privately to say they would like to attend get-togethers. Thank you for leaving such a challenging comment. I have spent sometime thinking about the situation you describe about how women can feel shackled. I think many women would have empathy because it is easy to get sucked into day to day life and to forget what, you, as a mother, wife and individual needs. I mention these roles in that order because that is how most women would describe their roles in life. A female conundrum. Perhaps it an internal identity battle? I am including my email address should you wish to join my group. It would be a pleasure. I attended a women’s event held by an international organisation and one of the women organising it told me that they do not use the word ‘feminist’ because it scares people. (Phah! I thought.) Now, if you add ‘feminist’ to the word ‘mother’ it must be doubly scary to people because autonomy and independence are not traits normally associated with the meek profession of being a mother. We are the silent minority but small groups can make a difference. I had not expected the attention I have received since this article was published and I now know that there is a need for feminist mothering. Do consider joining my group and we can explore your idea for family justice. It is great to find another woman who has read the book. Change does come about through the accumulation of individual efforts. At one of my talks a mother did bring along her daughter who had just had a baby and was struggling too. Unfortunately, the mother was disappointed when the daughter asked me whether she could, both, be in a relationship and be a feminist too. Therein lies the perceived fear of feminism and feminist mothering. I am arranging a meeting in February. Do join us. So, so true and this is what I find too. This is why I wrote this piece and am delighted that similar thinking mothers do exist in the UK. The traditional family model which is paraded as being the ideal does not allow any space for a mother’s individuality. Feminism is almost viewed as being subversive. Did you know that the Nazis employed brutal means to stamp it out? I am issuing you with the same invitation as I have with the others. Join my group. I am issuing you with the same invitation as I have with the others. Join my group and say ‘tomato’. In a neoliberal world it is becoming the case that paid work is seen as the only purposeful activity. Given the current state of the economy and the difficulties with part time work, “ambitious” or not, many people find themselves in jobs that they would not have chosen, and I don’t think this makes them poor role models for their children. Therefore I think it’s important that feminists recognise a variety of choices in parenting rather than resorting to tribalism with working mothers implying that full time parents are setting a poor example and full time parents claiming working mothers are deserting their offspring. Both groups stigmatise each other in different ways yet both can be valid choices that we should respect and choice is surely at the heart of feminism.